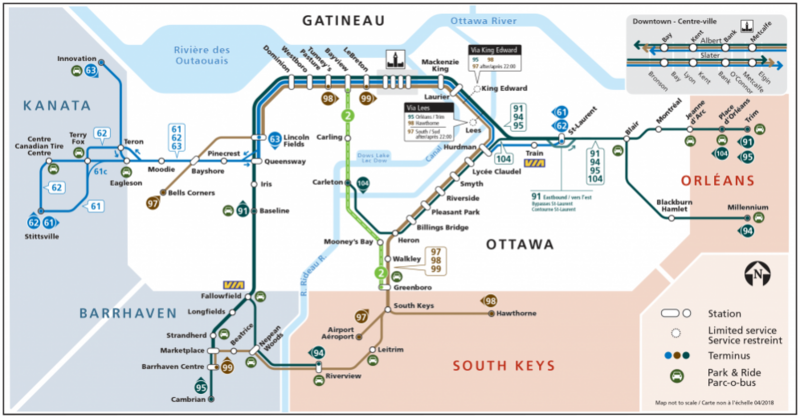 Transit stations are gateways from every urban community to fast and Frequent service 7 days a week on Rapid (Transitway) routes and the O-Train Trillium Line. Stations are often located next to a major shopping centre or employment area and many feature nearby or on-site Park & Ride lots. As many other bus routes —Local, Frequent and peak-period Connexion— connect to them, transit stations offer convenient transfer points for customers. Construction is also well underway for thirteen new multimodal O-Train stations that will open along the new Confederation Line in 2018. Dominion, Heron, Innovation, Iris, Millennium, Pinecrest, Pleasant Park, Queensway, Riverside, Riverview and Walkley Stations do NOT have a Bell payphone and OC Transpo Information Line, though they do have Emergency call boxes. Jeanne d’Arc Station does NOT have an Emergency call box. Lees Station does NOT have an Emergency call box*, Bell payphone or an OC Transpo Information Line. Fare-paid zone at the major connection stations - Hurdman, Blair, Tunney’s Pasture and Bayview - will let transferring customers bypass the fare gate.